It’s been quite some time since I have launched Day in a Sentence, the collaborative venture where I ask you, dear reader, to boil down your entire week or a day in the week (your choice) into a single reflective sentence. Then, you post your sentence as a comment to this blog post. My job is to collect all of your sentences and then publish them together over the weekend. So, what do you say? Do you have a pocket of reflective energy? How can you capture your week or a day in your week in a single sentence? Add your sentence to the comments here, and spread the word. Day in a Sentence is back! (albeit on a somewhat irregular basis). I can barely express how different the climate of my new class of students is from my old class, where “walking on eggshells” was my daily mantra and I was as much traffic cop as teacher. PS — What is the value in teachers becoming writers in places like Day in a Sentence? I tried to address this earlier in the year with this article over at LEARN NC. Here are the responses to this past week’s Day in a Sentence, which was done over at AnswerGarden. Wow. What happened to Day in a Sentence? It went on a little snoozer, I guess, as I kind of stepped away from the idea for a bit. But I miss seeing what folks write about when they mull over their day or week. So, let’s do a Day in a Sentence, shall we? But I want to use AnswerGarden again for collecting answers, so: let’s do DAY IN A SHORT PHRASE (or word) as AnswerGarden has a character limit. (optional): After your response has gone in, add your first name to AnswerGarden, too, so we can see who has been contributing. 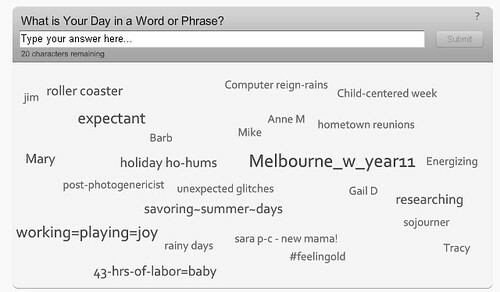 What is Your Day in a Word or Phrase?… at AnswerGarden.ch. Come join us for this week’s Day in a Sentence, which is over at Tracy’s Leading from the Heart blog (great name!). She has an idea for thinking about your sentence and then, just leave it as a comment at her blog. She will collect and publish this weekend. Last week’s call for Days in a Sentence moved the reflective writing activity over to Twitter and a lot of folks added their “six word” day in a sentence. Thanks to everyone who participated. This coming week, head over to Tracy’s blog to add your reflective Day in a Sentence, inspired by the month of June. 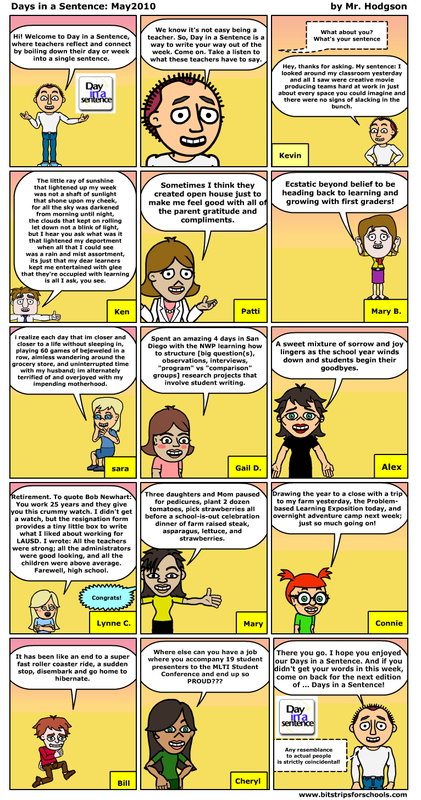 This week, I decided to take off the submissions for the reflective Days in a Sentence and add them into a Bitstrips Webcomic. Thanks to everyone who shared their words with us this week. Here is the link to the full size comic. I’m going to keep things simple and traditional, at least in the gathering of your words. I looked around my classroom yesterday and all I saw were creative movie producing teams hard at work in just about every space you could imagine and there were no signs of slacking in the bunch. My friend up north, Cheryl, is hosting this week’s Day in a Sentence and she is using Wallwisher for the activity. (Wallwisher is a virtual bulletin board). So, please, visit Cheryl’s Wallwisher, leave her a note with your Day in a Sentence, and come on back over the weekend to read what others have shared. My good friend from New Zealand, Ken — A Blogger in Middle-Earth –is taking over as guest host for this week’s Day in a Sentence. Given the news from the world about volcanoes and such, Ken asks that we take our sentence to the extreme — really kick your reflection up a notch, if you can. Not sure how Day in a Sentence works?